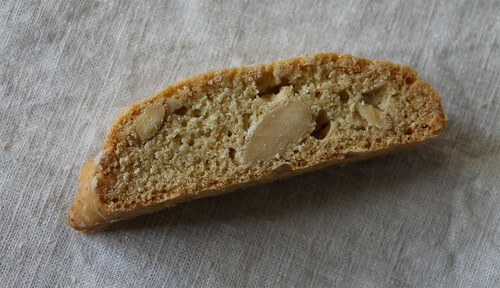 The base of this biscotti uses the same olive oil dough as the Pistachio Cranberry Biscotti. You can make it with butter, which will make for a richer tasting biscotti, but sometimes I like using olive oil for a lighter texture and a fruitier flavour. Frankly, it's a solid dough base to play around with your own flavour combination. Almond and aniseed, a classic combination. Ginger. Almond and cherries. Have fun with it! In a large bowl, mix together oil and sugar until well blended. Mix in the vanilla and almond extracts and zest, then beat in the eggs. Combine flour, salt, baking powder and nutmeg, if using, and gradually stir into the egg mixture. Add the almonds, mixing until just combined. Bake for 35 minutes in the preheated oven, or until logs are light brown and firm. Remove from oven, and set aside to cool for 10 minutes before cutting the logs on the diagonal into 1/2- to 3/4-inch thick slices. Lay on their sides on parchment covered cookie sheet. Bake approximately 12 to 15 minutes on each side, or until dry. Cool completely. For a finishing touch, you can dip or drizzle biscotti with melted dark chocolate.